Luciano Pavarotti "had the sun in his voice"
Opera superstar Luciano Pavarotti, who has died from cancer at the age of 71, launched his singing career at Wales' Llangollen eisteddfod. It was while performing at the international festival in 1955 with a male choir that the Italian tenor first tasted musical stardom. The tenor returned to sing at Llangollen 40 years later in 1995. Opera star Bryn Terfel said of Pavarotti: "His premiership voice put us all into the second division." Terfel said he was "deeply saddened" to learn of Pavarotti's death, calling him "a truly inspirational and awe-inspiring artist with a voice of pure gold". Llangollen eisteddfod chief executive Gwyn L Williams said Pavarotti's experience in Llangollen half a century ago had inspired him to turn professional. Pavarotti was training as a school teacher when he travelled to Llangollen aged 19 as a member of the Choral Rossini, a male chorus from Modena in northern Italy. The choir also included his father, an opera lover and gifted amateur tenor, and when they won first prize, it fired Pavarotti's musical ambitions. "He came to Llangollen for the first time as a young lad in 1955 with his father Fernando with a choir from Modena," said Mr Williams. "The choir had the first prize and Luciano Pavarotti was always referring back to the experience as the most important experience in his life and what inspired him to turn professional." "He once said if he could win the first prize with a small choir from Modena then he could do anything. And that what was his attitude to singing all his life." Four decades after his first appearance, Pavarotti - who became an international celebrity when he performed Puccini's Nessun Dorma at the close of the 1990 World Cup - returned to Llangollen. "He came back to Llangollen in 1995 to do a concert, a very special occasion and there were thousands there to see him." 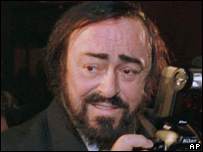 Pavarotti had been suffering from pancreatic cancer for some time and during this year's international eisteddfod in July, Mr Williams contacted Pavarotti's agent to ask her to pass on the message from the festival saying they were thinking of him. "This is a very sad day, someone once said that this tenor was one who had the sun in his voice, and they were right, he had a special ring in his voice which you can't mistake for any one else," he said. There had been plans for the Italian tenor to perform at the eisteddfod again during his series of retirement concerts around the world, but the promised appearance never materialised.